who are taking the medications. Their voices, extracted from interviews Karp conducted, color the pages with their experiences and reactions--humor, gratitude, frustration, hope, and puzzlement. Here, the patients themselves articulate their impressions of what drugs do to them and for them. They reflect on difficult issues, such as the process of becoming committed to medication, quandaries about personal authenticity, and relations with family and friends. 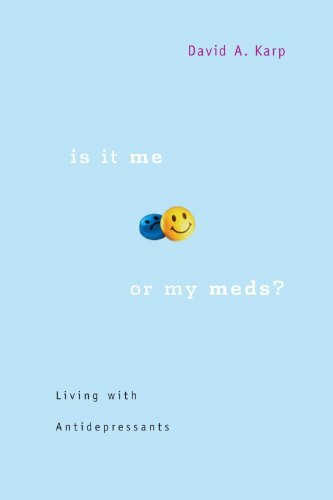 The stories are honest and vivid, from a distraught teenager who shuns antidepressants while regularly using street drugs to a woman who still yearns for a spiritual solution to depression even after telling intimates "I'm on Prozac and it's saving me." The book provides unflinching portraits of people attempting to make sense of a process far more complex and mysterious than doctors or pharmaceutical companies generally admit. David A. Karp is Professor of Sociology at Boston College, and the author of Speaking of Sadness: Depression, Disconnection, and the Meanings of Illness and The Burden of Sympathy: How Families Cope with Mental Illness.